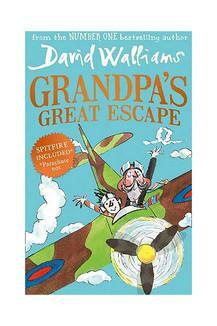 David Walliams'eighth fiction title! The much anticipated next book from bestselling phenomenon David Walliams, packed with excitement, adventure, hilarity and heart! His previous novel, DEMON DENTIST, sold more than half a million copies in less than a year, and the paperbacks of his other titles continue to dominate the UK charts. David's books have been translated into 40+ languages and have sold over 6 million copies in the UK alone A Children's Bookshelf Selection: Each month our editor's pick the best books for children and young adults by age to be a part of the children's bookshelf. These are editorial recommendations made by our team of experts. Our monthly reading list includes a mix of bestsellers and top new releases and evergreen books that will help enhance a child's reading life. Since his debut children's book published in 2008, David Walliams is the biggest British children's author to debut this century. His most recent novel, AWFUL AUNTIE, was published in September 2014 and was the overall bestselling book in the UK for a sensational six weeks and became the biggest selling book of 2014. His books RATBURGER, DEMON DENTIST and AWFUL AUNTIE, have all won the National Book Awards Children's Book of the Year.